Kananaskis lakes map area (NTS 82-J/11, 1:50 000 scale) straddles parts of the Front Ranges and Main Ranges subdivisions of the Southern Canadian Rocky Mountains. Five major thrust faults (Misty, Rundle, Lewis, Sulphur Mountain, and Bourgeau) carrying variably folded Paleozoic and Mesozoic carbonate and clastic strata dominate the structural geology. A prominent zone of transverse faults, with a synsedimentary, basement-controlled origin, crosscut Paleozoic strata in each thrust sheet. A change in level of exposure to Cambrian, Ordovician, and Middle Devonian strata marks the transition into the Main Ranges. The southeastern termination of the Cambrian Kickinghorse Rim, an abrupt facies change from competent platform and ramp carbonate units to thick basinal strata, occurs in the western part of the area. Hydrothermal alteration localized immediately inboard of the rim produced zinc showings in the Albert River drainage. Six Late Ordovician to Early Devonian, mafic diatreme breccia pipes occur along the southeastern edge of the Main Ranges. This 1:50 000 scale map is the last of 6 maps outlining the very complex geology of the southern Rocky Mountains in the Kananaskis west half map area of British Columbia and Alberta. 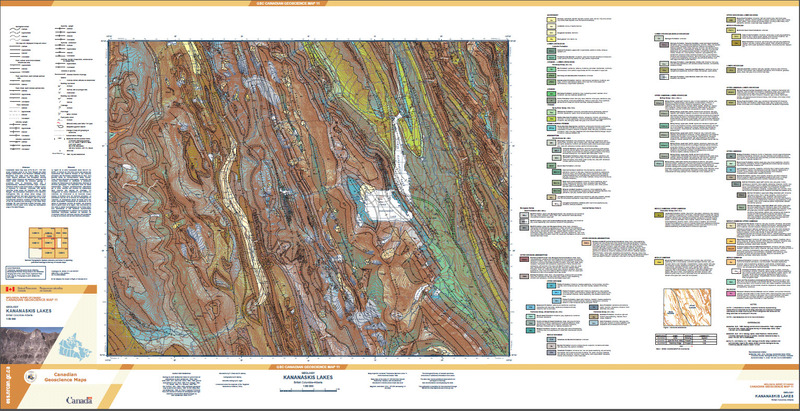 These maps updated the geology of an area where there previously were large blank areas in the available mapping. Over 60 different rock units spanning Cambrian to Cretaceous (~ 515 - 140 million years ago) occur in the Kananaskis Lakes 1:50 000 map sheet. A major change in lithology from shallow water carbonate to deeper water shale occurs in Cambrian and Ordovician strata in the western and southern part of the map area. Several zinc showings occur along this change. The relationships portrayed on this map form important easily accessible and well exposed analogues to petroleum bearing structures in the subsurface of sedimentary mountain belts around the world.